Currently viewing the tag: "Natalie Atkinson"
Journalists who write about fashion must constantly test themselves for unconscious biases that shape their coverage, the senior curator of the Bata Shoe Museum recently told more than 100 Ryerson University fashion and journalism students. Elizabeth Semmelhack, who is also an adjunct professor at the Ryerson School of Fashion, said the traditional gendered approach to fashion writing tends to implicitly view fashion as a frivolous and feminine preoccupation. In fact, fashion has throughout history been a major economic driver, she said, noting that demand for clothing underpinned the early textile industry. “Fashion is gendered. 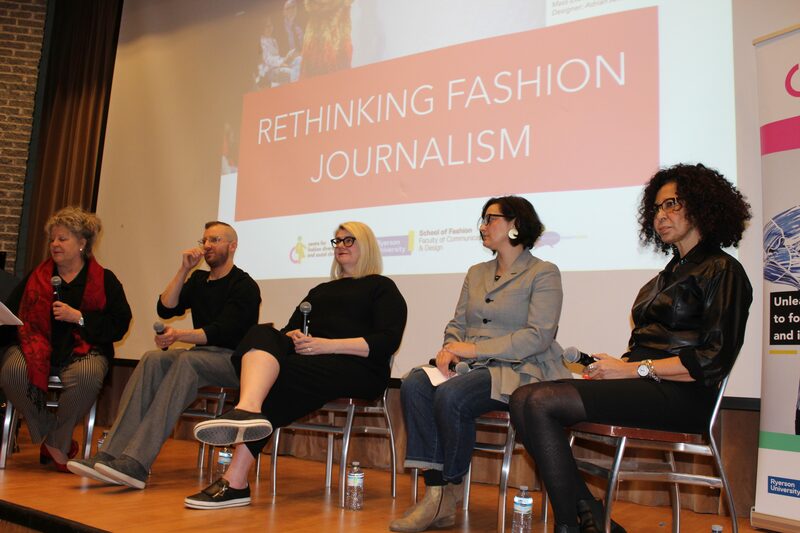 We all wear clothing, but we have assumptions about dress that are invisible, and we need to change the dialogue,” Semmelhack said during a March 27 panel discussion on the use of fashion journalism as a tool for cultural criticism and a driver of social change. “Rethinking fashion journalism: It’s about more than the clothes” was organized by the Ryerson Journalism Research Centre and Ryerson’s Centre for Fashion Diversity and Social Change. Semmelhack, whose research ranges from the rise of sneaker culture to the history of high heels, said that shoes from non-Western cultures, such as the tiny shoes associated with Chinese foot binding, often prompt questions from members of the public who visit the Bata collection. Western stereotypes about fashion are less likely to be questioned, however. For example, gendered assumptions are so deeply embedded that people seldom wonder why only half of the population – women – wear heels: “There has always been a presumption that women love shoes and are known as the ‘shoe-aholic.’ My research has proven that men were the first to wear heels and now it is becoming common knowledge because fashion journalists are reporting on it,” she said. Ben Barry, associate chair of the Ryerson School of Fashion and director of the Centre for Fashion Diversity and Social Change, said fashion journalists have driven social change by starting a dialogue about diversity, equity and inclusion. Barry, whose research explores the intersections between gender, fashion and consumption, said fashion journalists play a powerful role as the link between the industry and consumers, activists and government. Major changes in the industry have often been driven by fashion journalists who have examined what’s happening in fashion, have voiced critiques and have exposed issues off the runway. The panelists noted, however, that there are topics that still need more critical examination. Natalie Atkinson, an arts and culture freelancer who writes a regular column for the Globe and Mail, said fashion critics have a role to play in driving change in the plus-size part of the industry. The topic is under-reported she said, and both fashion critics and consumers must push for more variety in plus-size clothes. Charmaine Gooden, a freelance beauty and health journalist, said the lack of diverse voices remains a problem in fashion journalism. Atkinson concurred, noting that newspaper newsrooms are still limited when it comes to presenting diverse writers who deal with fashion and fashion issues. She pointed to a piece she wrote for the Globe about the history of the Cowichan sweater, which adapted the centuries-old Coast Salish knitting tradition to become, arguably, Canada’s first cross-cultural fashion garment knit by the Indigenous Peoples. Atkinson said she felt the story should really have been written by an Indigenous person: “I’m less comfortable writing about things that I’m not on the inside of. I’m more interested in writing less and listening more. Even though I’d done a lot of research around it, I felt like there was a perspective that even I couldn’t understand if I’m not on the inside. I’m hoping there will be more people stepping aside (to allow for more diverse voices),” she said. Barry urged aspiring fashion writers in the audience to question their gendered assumptions about fashion and to dig deeper for context. As an example of how gendered assumptions shape coverage, Barry pointed to research by Allyson Stokes, who is an assistant professor at the University of Waterloo in the faculty of knowledge integration. In The Glass Runway, Stokes reports that male designers tend to be portrayed as geniuses who come up with incredible creations while the work of female designers is discussed in terms of their efforts to understand and create practical clothes suited to women’s bodies. This creates an hierarchy that places more value on creativity than on craft and art. Fashion writers, Barry said, need to be on constant guard against overt and unconscious biases: “Are there certain tropes or stereotypes or assumptions that are being perpetuated within that story? And how (are we) talking about particular individuals? Whether these are people of colour or whether these are gendered assumptions,” he said.